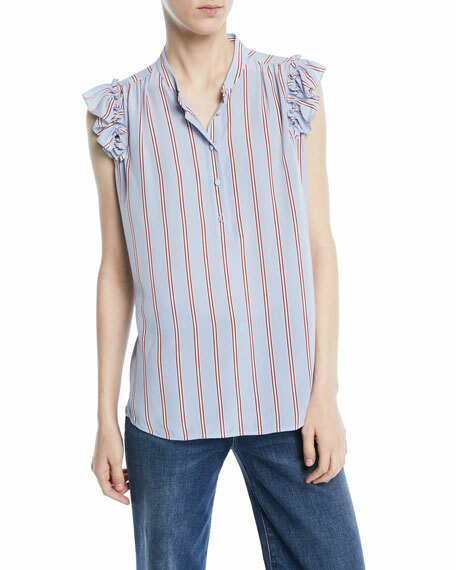 FRAME top in striped silk with ruffle detail. 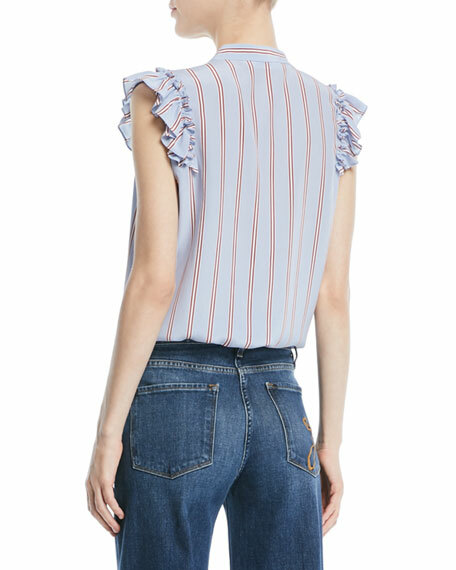 Current/Elliott striped muscle tank with ruffle trim. Crew neckline. Sleeveless. Relaxed fit. Side-split hem. Slipover style. Cotton. Made in USA. Model's measurements: Height 5'10"/177cm, bust 33"/84cm, waist 25.6"/65.2cm, hips 35.8"/91cm, dress size US 2-4/FR 34-36. FRAME "Le Cutoff" denim shorts. Approx. measurements: 8.5" rise; 3" inseam. Mid-rise; belt loops. Button-zip fly. Five-pocket style. Slim fit. FRAME "Le Cutoff" denim shorts. Approx. measurements: 8.5" rise; 3" inseam. Mid-rise; belt loops. Button-zip fly. Five-pocket style. Slim fit. Frayed, cutoff hem. Cotton/modal rayon/polyurethane. Made in USA of imported materials. Model's measurements: Height 5'10"/177cm, bust 33"/84cm, waist 25.6"/65.2cm, hips 35.8"/91cm, dress size US 2-4/FR 34-36.